This recipe comes from “My Italian Garden”, by Viana La Place. I’ve made it my goal to photograph her recipes as often as time allows. They are simple, beautiful, and quite underrepresented in her book. How can one understand the beauty of raw zucchini without a photograph? I also find her instructions interesting, she even instructs the reader on the preferred shape and color of the platter. La Place really emphasizes that food is part of a beautiful life. I couldn’t agree more. This dish is simplicity in beautiful Italian form. It may not be for everyone, as many of us are not used to raw zucchini. I found it wonderfully clean tasting, just slightly rich from the olive oil, and salty from the Parmigiano-Reggiano cheese. The almonds add texture and another dimension to this summer salad. You’ll need a mandolin or wide vegetable peeler to make this one. SPREAD the almonds on a baking sheet and toast for approximately 10 minutes. Remove from the oven and let cool. SELECT a large oval platter, preferably white. Use a mandolin or a wide vegetable peeler to make long shavings of zucchini. Spread the zucchini on the platter, drizzle with olive oil, and sprinkle lightly with salt.Working over the zucchini with a standard vegetable peeler, SHAVE enough Parmesan to lightly cover the zucchini. Coarsely CHOP the almonds and distribute evenly over the cheese. Immediately before serving, embellish with an additional very light drizzling of olive oil. I just wanted to let you know I'm still in Boston, but will be home in a couple days and come see what you all have been up to! The recipe sounds great, and I will try it in a little while. Recently I made a raw fennel salade with lime vinaigrette. And I made the same experience. The taste is very clear and fresh. Lovely pictures and a great recipe. I love raw zucchini and make a marinated salad that is also very fresh with dill. Can't wait to try this one. Very interesting recipe. Beautiful photo. Did you follow her instructions in your plating? It looks lovely. Well I love raw zuccini so this is a perfect recipe for me. Sounds like a great book. What a beautiful presentation of a wonderfully simple dish. Very nice! Beautiful zucchini dish! I've been meaning to add some of her books to my collection, and now I'm inspired to do so right away. What a refreshing, healthy meal option for summer. And it's low carb, yay! Thanks for sharing the recipe, and for posting the photo on Tastespotting. These are fancy and look really refreshing! 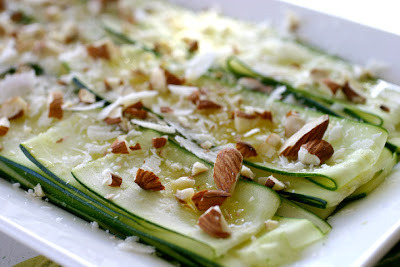 I was actually going to make zucchini carpaccio for lunch and put it on my blog! Haven't we done this before? The photo is gorgeous! That looks light and delicious, and really lovely photography too!